@metacole spotted this little gem in a Strait Times report on ex-Miss Singapore World Ris Low, entitled "I will not give up crown". Apparently someone had named the accompanying photo of her "sg-stupid.jpg". inju on Flickr has another screenshot. I went to Cancun, Mexico and checked out the buzz around the movie Cloudy with a Chance of Meatballs. 1. It is illegal for cars to turn right (in our case, it would be left) in front of a bicyclist. Motorists must look out for and yield to cyclists before making the turn (YOU HEAR THAT, SBS and TIBS buses?). 2. Cars must yield to bicycles when making a left turn (or in our case, a right turn). 3. Overtaking motorists must leave 3 feet of space (about 1 metre) between their vehicle and a bicycle (YOU HEAR THAT, SBS and TIBS buses?). 4. Motorists must exercise due care when opening their doors. 5. It is illegal for a car to park or stop in a bicycle lane. 6. Bicyclists must yield to pedestrians like motorists do, on roads. 7. At night, bicyclists must have a light in front, and a rear reflector or light. 8. Bicyclists must not ride against the flow of traffic on the road. 9. Bicyclists can use the same lane as cars to make turns. Be patient, give way. My life, and any road user's life, is worth 5 seconds of your time. Thanks! I go up high to show you what the city looks like lighted up like a giant Christmas tree! Just a little Qik live stream of our seats at Turn 1 Grandstands. It was a great vantage point to see the action. Even saw Red Bull buang in front of us. Thanks to Philips, we had a little tour of the AT&T Williams garage and VIP guest room. 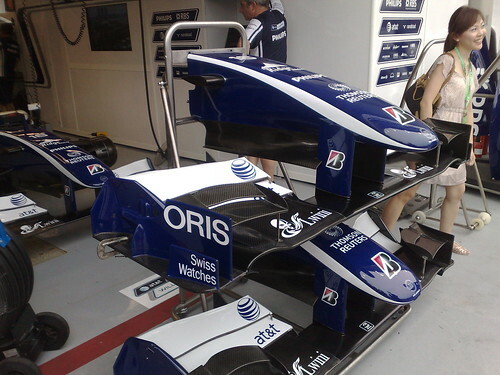 We saw both Nico Rosberg and Kazuki Nakajima's cars in the garage and the engines being prepped. I would have loved to show you photos of the top secret garage but if I took any, those would be the last photos I'd be uploading. 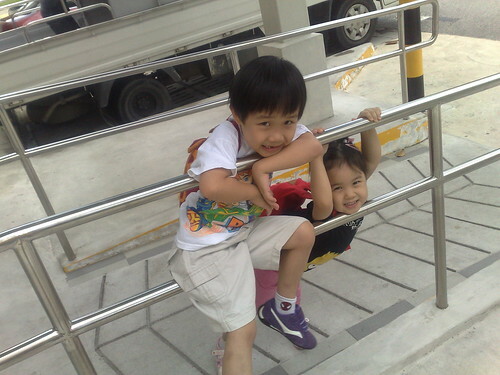 Isaac and Joy are waiting for Grandma to take them to watch the movie G-Force. Then tomorrow, it's the Bird Park with their kindergarten. Life is grand when you're a kid. 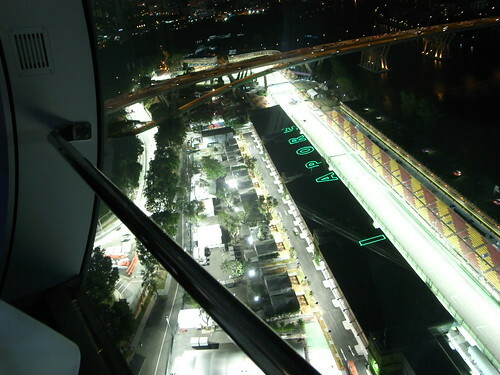 Take a tour with me at the Pit Building and find out more about the track lighting of the Singapore Formula One circuit! 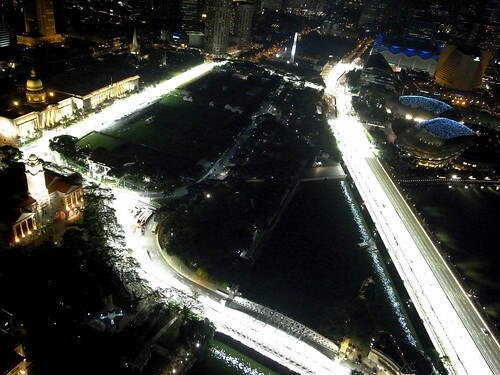 Formula One night circuit looks like from high up and lit up. Ryan and I were shooting from the top of Maybank and I took this photo with my GRII. Corrupt chefs! Sharksfin kickbacks! Dead squid! All this and more at mrbrownshow.com! 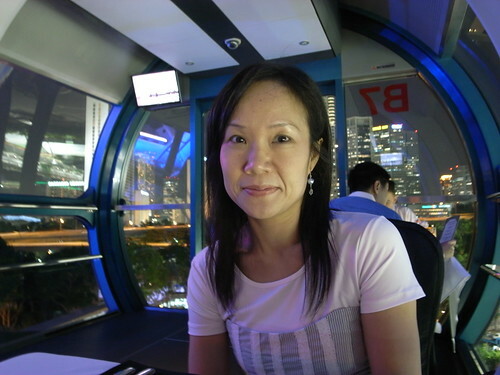 The wife and I had a lovely time dining in a Singapore Flyer capsule last night. It was the first time in the Flyer for her too. The dinner, served by a personal butler (one to a capsule of three tables), was served over two rotations of the Flyer, totalling about an hour. We had our starter and appetiser in the first rotation and main course in the second rotation. It was quite funny to see the staff moving briskly with our main course when the capsule reached the start of the lowest point. They had to come in with our food quickly because the Flyer khad to keep moving, of course. We also made sure we went to the loo before we entered the capsule because you can't make your pit stop during the course of the dinner. 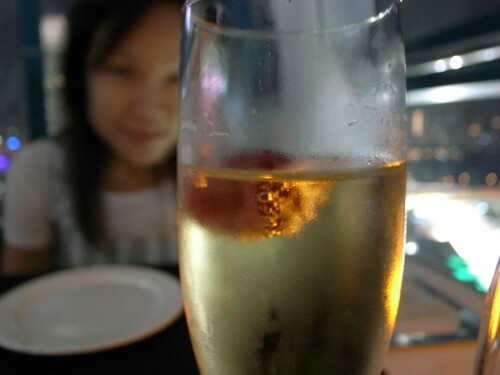 The view was spectacular and the food was quite good (though the main course could have been warmer). We finished with dessert in the VIP lounge area after we left the capsule, tucking in while seated in a comfy sofa in front of a big screen tv. We had a good time chatting and laughing at the wooden Singtel Grid Girls show on tv. Malaysian Tourism Minister Ng Yen Yen claims that some dishes have been hijacked by other countries and wants to claim them back. Dishes like laksa, nasi lemak, bak kut teh, and even hainanese chicken rice. So we Singaporeans have been eating pirated dishes ah? In fact, the Hainanese in China had better watch out. Stop stealing Malaysian dishes, you crooks! Don't you know that all good food originated in MalaysiaTrulyAsia? That's what the slogan means! Only Malaysia is Truly Asia. Everyone else... FAKE! Coming soon... The Real Nasi Lemak®, The Real Hainanese Chicken Rice®, The Real Bak Kut Teh®: All rights reserved, Malaysia Tourism Ministry. Unspun: "Whose Chicken Rice is it anyway?" Associated Press: "Malaysia crabby over right to 'hijacked' recipes"
Find out what went into the making of the Trophy for the Singapore Race. And also indulge in the Arts during the Singapore GP Season as well, at Asia on the Edge. Why is a Singapore private college leaving spam comments on my blog? I have seen, so far, comment spam trying to promote a certain private college in Singapore. The author is always entitled "Degree Singapore", and the URL it points to is the website of the college and a Hotmail email address with the college's name on it. The comments are along the lines of "bloggers have made things real easy" and "blogs have become avery common and low cost form of marketing online. Good for Bussinesses!" The spam is also occurring in sites like ShaunChng.com, [email protected], and Sandeep's blog. Raƒƒles [email protected] C0rp C0llege, care to explain? Being a big fan of The Diva of Jeeb-bra, I joined this Facebook group, The "Booms Fan Club". I do not know if it was planned or a really powerful Facebook feature that showed this banner ad from Morris Allen English when I visited the group's page. Needless to say, I clicked "Like". We could not resist doing this remix to the Queen of Hospipatalipality and Leopard Prince. She's so so so Hot Hot Hot (echo echo echo). This time, the music video is another hit from our favourite girl group, the Wonder Girls. Who, incidentally, look like they are into Leopard Prince too!